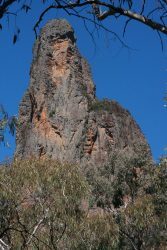 The Warrumbungles ia a favourite place for me, ever since we first visited in 1981 at the start of 13 weeks long service leave. 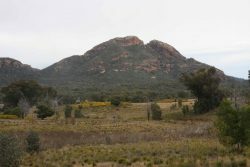 The facilities for visitors and campers have improved significantly over the years with power sites, paved roads, gas BBQs, rubbish bins, dump point, picnic tables, etc., but, unlike Victoria, still at a reasonable price. 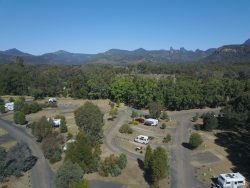 I have a NSWNPS pass that exempts me from the $8 daily vehicle fee so camping on a power site was only $12 per night. 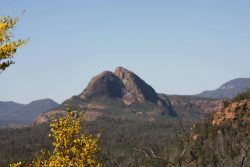 However it is the rugged ranges of the Warrumbungles that remain the great attraction. 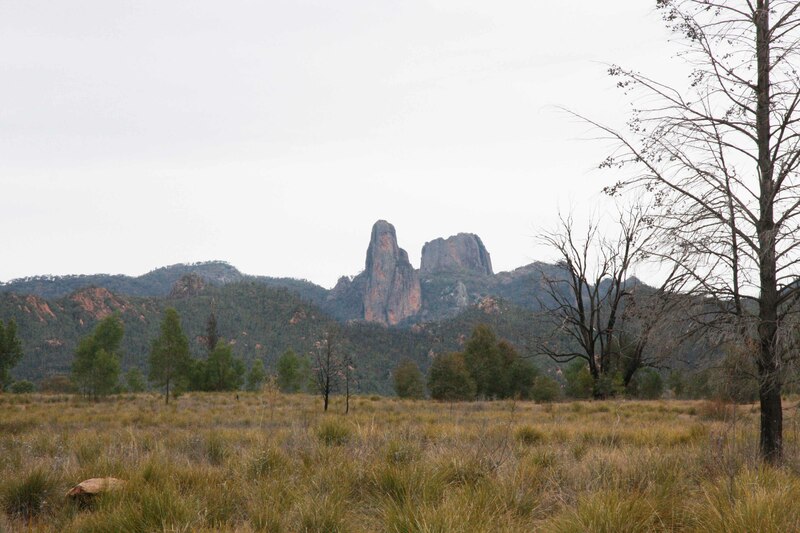 The volcano that formed the Warrumbungles started erupting 17 million years ago and continued on and off for the next 4 million years. 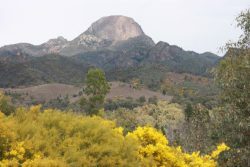 The volcanic dome was 50 Km in diameter and the rock formations that we see today are the remaining hard rock after millions of years of erosion. 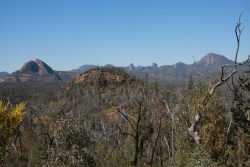 The camping area was burnt out in the 2013 bushfire, the camping area was completely ash a ranger told me, melted power outlets, etc. but they managed to save the shower block. The recovery is amazing as you can see from the photo of the camping area below. 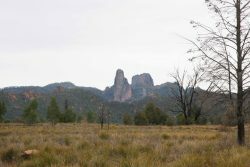 I arrived at the Warrumbungles on a cold overcast day, but after setting up I completed a 5 Km walk around Belougery Flats that starts and ends at the camping area. 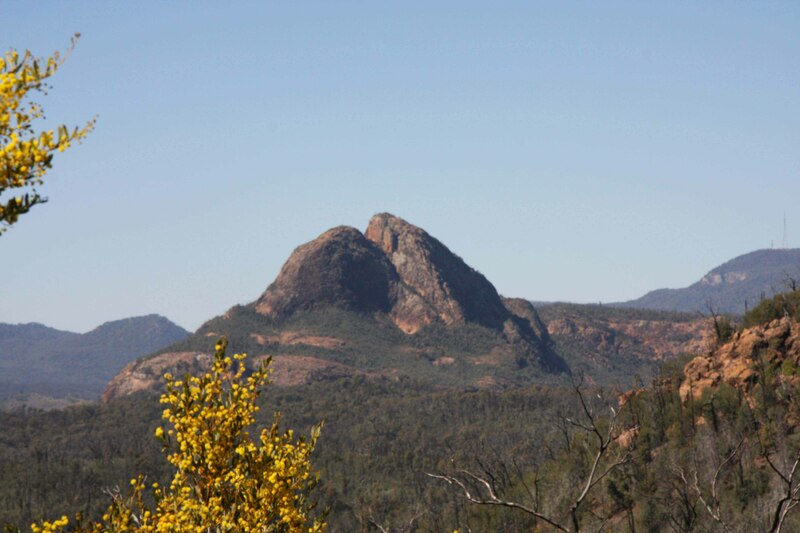 It is a peaceful fairly flat walk that gives views of the grand High Tops, Mt Exmouth and Belougery Split Rock. 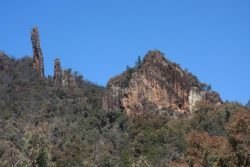 Every time you turn a corner you see a different view of these massive rock outcrops. 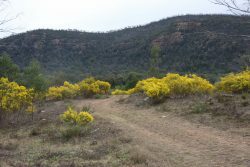 Wattle is coming into flower and that added some colour on what was a very overcast dull day. 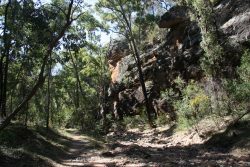 Next day it was off to the Tara Cave walk, a 3.5 Km walk to a small cave used by aborigines for the last 4,500 years, until 150 years ago. 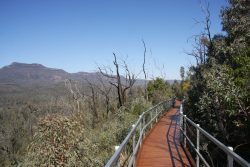 The walk had some steep sections and the last part was on a boardwalk. 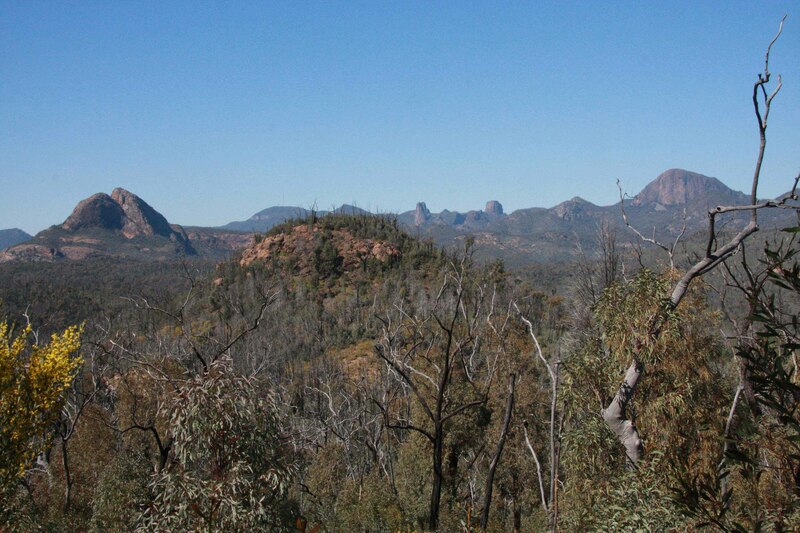 Lots of fabulous views along the way, sadly opened up by the 2013 bushfire. 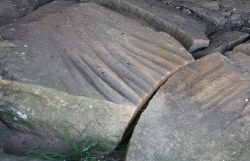 There was no artwork in the cave but some grooves in a couple of rocks made by aborigines sharpening stone axes. 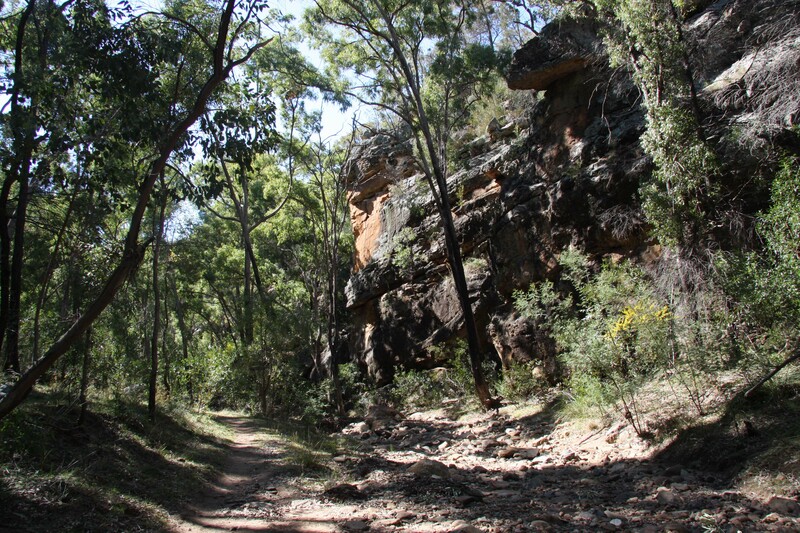 After the walk to Tara Cave, I headed to Burbie Canyon Walk, which was a 2 Km fairly flat walk along a creek that lies within high rock walls. 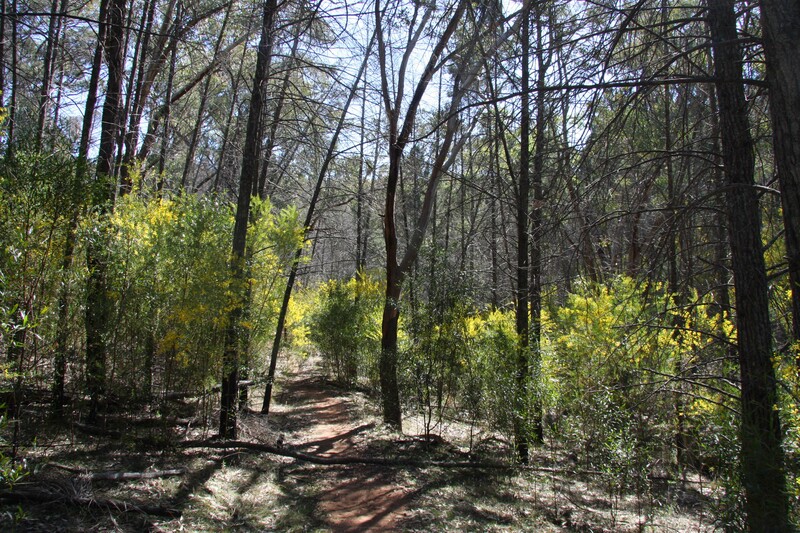 It was an easy, enjoyable walk with lots of wattles in flower and the ever present buzz of bees on the wattles. I was very happy to spot a pardalote on the walk, I haven’t seen one since we left Ferntree Gully. They are such tiny beautiful birds. 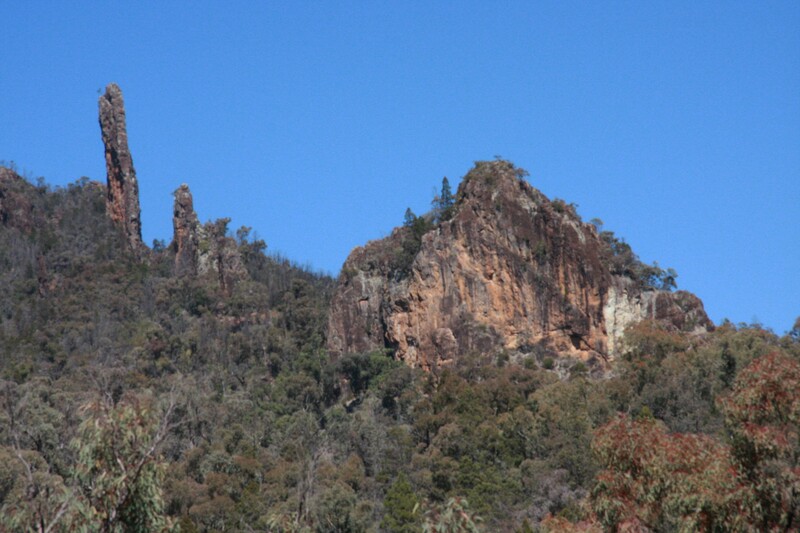 My next walk was on the Grand High Tops Circuit. 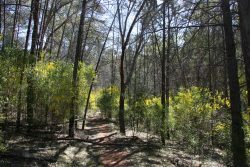 I completed a 9 Km return part of the walk, which is 14.5 Km long. 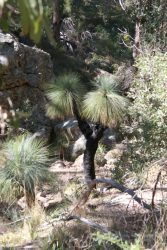 It was a beautiful walk, but consistently uphill on the way out, some of it quite steep such that you had to take small steps on on the way down. 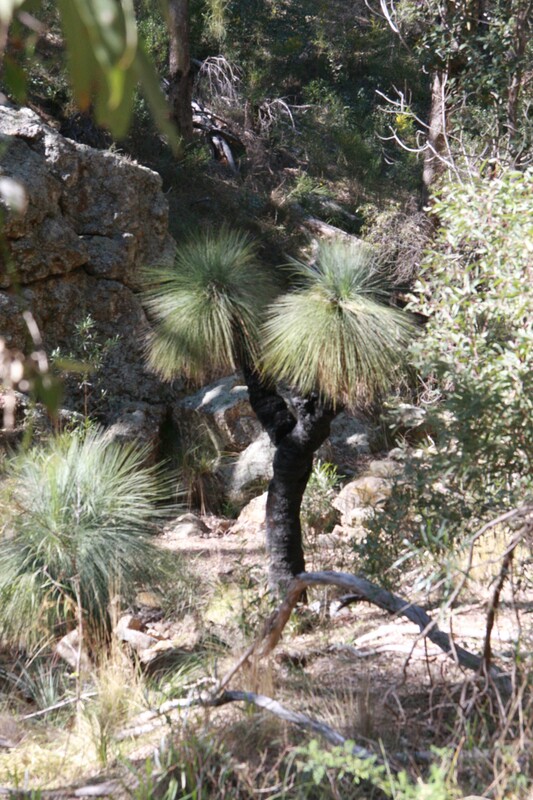 The park suffered a major bushfire in 2013, but the creek valley that the walk followed was lightly burnt, so the trees and bush have completely recovered in the valley. Lots of wonderful views along the way. 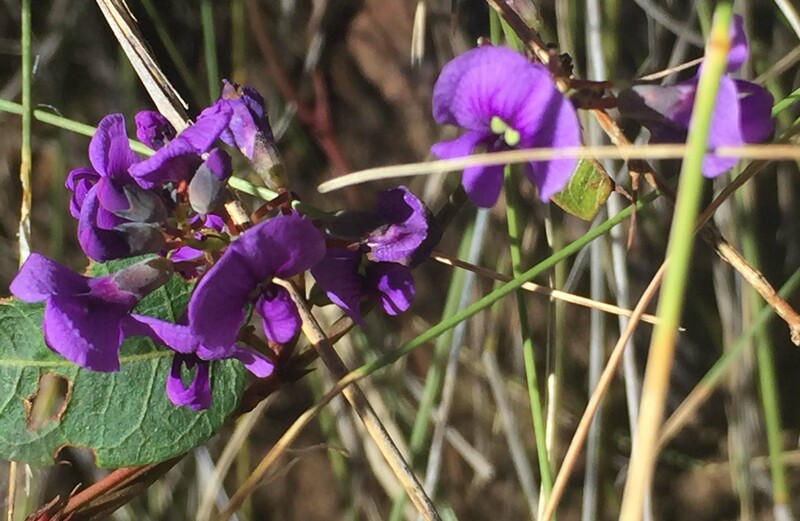 Even though it was very dry there was some maidenhair fern along the way together with Hardenbergia creeper and lots of grass trees. 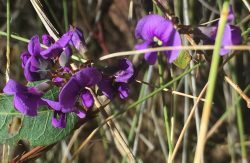 I am off to Dubbo tomorrow to stay with friends Bev and Richard who have retired to a 40 Acre hobby farm from a sheep station near Walgett.